MAMA BEAR maple wood disks are Exclusive to WILD BUBZ® + made by Teething Baby Australia. Your choice of any three coloured silicone beads, made on a rosegold keychain with maple wood beads. Brand with your own business or logo and expand your retail. Mama bear disk beads, keyrings, and silicone beads available seperately in the wholesale section of this website. 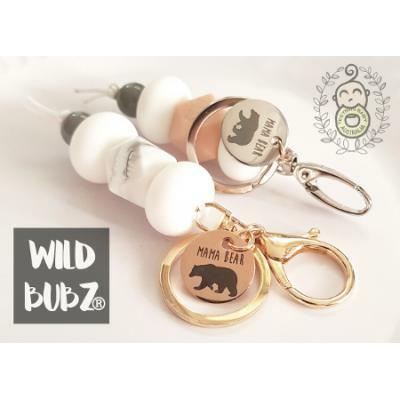 Teething Baby Australia + WILD BUBZ® keyrings + accessories are intended for adults only. Please do not give keyrings and accesories to childeren under the age of 3 years old. We also warn parents not to leave a child under the age of 3 unattended with any of our jewelry, keyrings or accesory products. Keyrings are not a toy. Customise your key chain with the name and colour scheme of your choice! 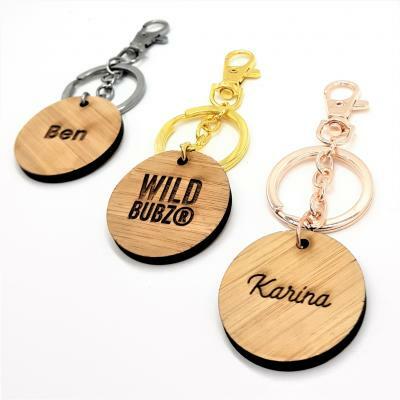 Select a bamboo name charm..
Personalise a custom bag tag | Keyring / key chain with any name. Perfect for bags, nappy bags, s.. Designed and made in Australia by Teething Baby Australia / WILD BUBZ®.. Custom Engraved Key Ring | Mum | Nan | Mumma | Grandma This keyring / bag charm is grea..
PERSONALISED | Keyrings - bag tags / nappy bag charms / zip pulls / silicone letters Y..
MAMA BEAR Stainless Steel + Rose Gold personalised mama bear keyrings / nappy bag charms, ..
PERSONALISED | Keyrings - bag tags / nappy bag charms / zip pulls / Beech wooden letters ..
Non-toxic silicone + maple wood personalised mama bear keyrings / nappy bag charms, MAMA BEAR maple ..
PERSONALISED | Keyrings - bag tags / nappy bag charms / zip pulls / white letters Your choi..
PERSONALISED | Keyrings - bag tags / nappy bag charms / zip pulls Your choice of; name + Fe..
Crochet cotton + wood bear crown keyrings / nappy bag charms by WILD BUBZ® + made by Teething Baby A..